The Ford Reflex embraces the new design signature. DETROIT -- After years of struggling with vehicle designs that communicated a fuzzy brand identity, Ford Division is quickly rolling out a new signature look. The new style abandons Ford's late-1990s desire to capture the European panache of Volkswagens and Audis. Instead, it embraces a simpler American look that borrows from the automaker's iconic -- and big-selling -- Mustang. Two vehicles unveiled at last week's North American International Auto Show in Detroit, the Edge crossover and the sporty Reflex concept car, both bear the new brand markings. The same design cues, referred to internally at Ford Motor Co. as Modern Styling, already exist on the Ford Fusion, which went on sale last year. They will be applied where feasible to existing Ford products, such as the Escape SUV, as well as to new models, such as the upcoming re-engineered and restyled F-250 pickup. Modern Styling includes a three-bar chrome grille, a slightly arched "power dome" hood, broad shoulders and an absence of side lines, such as creases and trim. Together, the elements create what Peter Horbury, Ford Motor's executive director of North American design, calls "the clean look of Ford cars" from the 1960s. Other brandwide cues include four-piece quad headlights and dual exhaust pipes to recall the muscle car look of the Mustang. "Ford is undergoing a design renaissance," says Paul Carrannanto, a principal with A.T. Kearney Inc.'s automotive practice in Southfield, Mich. "They've suffered from a lack of identity since the 1990s. You can see it in the Ford Five Hundred. "I'm sure it's a great car, but they clearly benchmarked the Europeans for that look, and now it just doesn't say anything." Horbury acknowledges the Five Hundred as the brand's turning point. "No more European," pronounces Horbury, an Englishman who ran Volvo Car Corp.'s global studios for more than a decade. "The Five Hundred was not a success." Horbury was recruited to his current Ford post two years ago to help sharpen Ford's North American identity. He says the new designs are intended to recapture what U.S. consumers associated with Ford a generation ago. "If there's a change, it's that we've stopped trying to be global in our design," Horbury said during the show. "Bold American design is something that's ours to use. It's not European. "It comes from what we see as a desire by Americans to buy American." 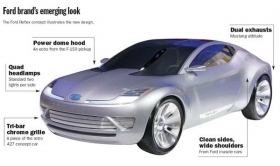 Ford actually surprised itself with the unveiling of the retro 427 concept car in 2003. 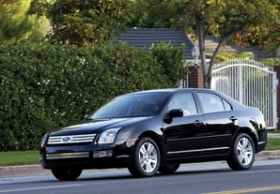 The reaction proved so positive that Ford immediately transferred its cues onto the Fusion, then in development. "A Ford is a Ford and an Audi is an Audi," he says. "Germans just do German cars better than we can." Kearney's Carrannanto says such a design upheaval could benefit Ford in the showroom. Kearney completed a study last year that linked bold design with brand share growth. According to the study, brands such as BMW, Nissan and Chrysler that have executed bolder stylings have increased sales, while brands without bold styling - notably Ford and Chevrolet - have not.